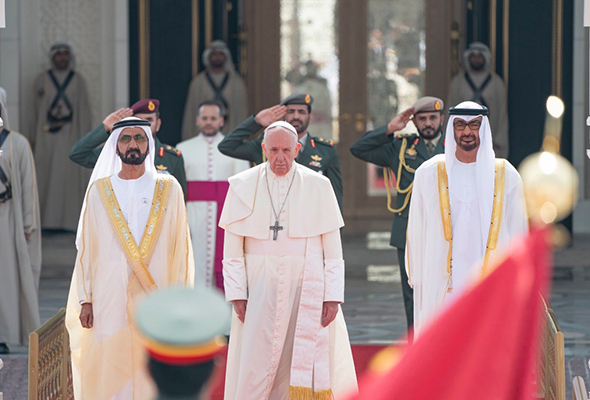 Vice President and Prime Minister of the UAE and Ruler of Dubai, His Highness Sheikh Mohammed bin Rashid Al Maktoum and Crown Prince of Abu Dhabi and Deputy Supreme Commander of the UAE Armed Forces, His Highness Sheikh Mohamed bin Zayed Al Nahyan received Pope Francis on Monday, February 4 at the Presidential Palace in Abu Dhabi. The Pontiff was accompanied by cavalry on Arabian horses and was then honoured with a 21-gun salute. The Papal Anthem and the United Arab Emirates national anthem were then played. The Dubai Ruler and Abu Dhabi Crown Prince warmly welcomed the state guest, as they expressed their happiness at the historic visit. The present Apostolic Vicar, Bishop Paul Hinder OFM Cap. and other representatives from the Vatican were also present alongside the Pope. 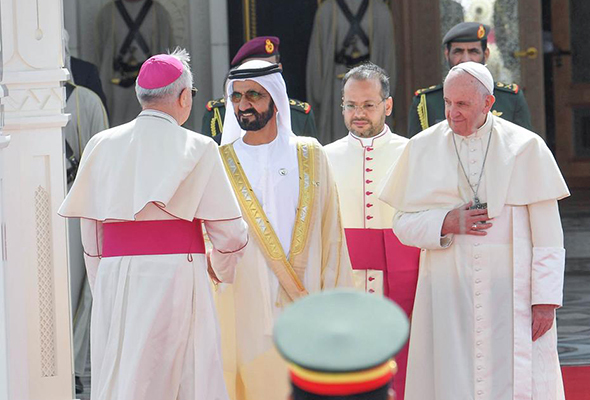 The Dubai Ruler and Abu Dhabi Crown Prince also expressed their confidence that the Pope’s visit will only help to strengthen the values and practices of tolerance practiced in the UAE whose people live in social harmony, peaceful coexistence, and culture dialogue. Pope Francis expressed his happiness by the visit, adding that the visit is a new phase of fraternity between nations and various faiths, according to a statement on Sheikh Mohammed’s official website. They were joined by other representatives and officials from the UAE. The Bishop of Rome is on a three-day visit to the UAE during which will he will visit the Grand Mosque, and attend a private meeting with members of the Muslim Council of Elders. The primary reason however for the Pope’s visit is an International Interfaith Meeting, which will take place at the Founder’s Memorial. The Pope leaves back for Rome on Tuesday, February 5 but not before he serves Mass for the faithful here in the UAE. The mass is being held at Zayed Sports Stadium in Abu Dhabi. The faithful from all around the UAE will be flocking to hear the Papal Mass in around 1,000 buses that will leave as early as 11pm on February 4. Buses from other Emirates will be departing early to reach the venue in good time as well. Ticket holders received a day off so that they can attend the once in a lifetime mass and certain schools have also received a day off on Tuesday, February 5, while some schools in Dubai and Sharjah received a two-day off from Monday, February 4 to Tuesday, February 5. Several road closures were also announced by the Department of Transport in preparation for the Holy Mass that has an expected attendance of 1350,000 people. You can read more about the road closures here. The decisions come in hopes to ease traffic congestion for the masses.